Kolkata is famous for their "Street Food", like Chops, Cutlets, Tele Bhaja, Rolls etc. Bongs love to have their evening snacks with "Chop & Muri". These snacks are easily available in every where and cheap in cost. Today I'm going share the famous "Vegetable/Bhegitabil" chop with you. Vegetable or I should say Bhegitabil Chop is a very famous Bengali evening snacks. The term "Chop" is nothing but cutlets or croquette, used in Bengal. There are many different types of "Chops", like "Aloor Chop, Mochar Chop, Macher Chop, Chicken Chop, Dimer Chop" etc. 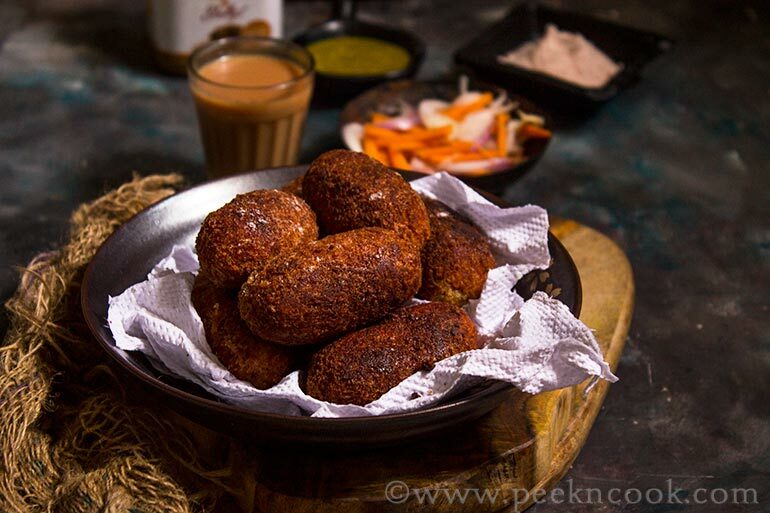 Croquette/Chops are made with spiced minced meat or smashed vegetables, dipped into egg & cornflour batter and coated in breadcrumbs, then deep fried. This cutlets/chops are available in every Roadside Roll Corners in Kolkata. Vegetable or I should say Bhegitabil Chop is a very famous Bengali evening snacks. The term "Chop" is nothing but cutlets or croquette, used in Bengal. First take the chopped vegetables including green peas, put into pressure cooker, add enough water, salt and pressure cook upto 2 whistels. Turn off the heat and keep aside the cooker. In the mean time do the rest of the job. Take a small pan and dry roast all the ingredients under the heading "For The Rosted Spice Mixture/Bhaja Moshla ". When a nice fragrance comes from the dry roasted spices, turn off the heat. Let the dry roasted spices completely cool down. It will take 2-3 minutes. Now take all the dry roasted spices into a small dry spice grinder and grind them. Take the vegetables out from the cooker and mash them very well. Add salt & sugar and mix. Now heat 2 tablespoons of vegetable oil in a pan, and fry the halved peanuts and take them out of the pan and keep aside. Now fry the green peas and take them too and keep aside. In the same oil, add chopped green chili, grated ginger and fry for 10 seconds. Add mashed vegetables, the roasted bhaja moshla and fry all together. Fry the mixture till the excess water evaporates and mashed vegetable mixture will come together, stirring constantly. Add the fried halved peanuts, green peas & chopped cilantro and mix with the vegetable mixture. Let the mixture to cool down completely. Prepare the batter in the meantime. Take chickpea flour, egg whites, salt in a medium size bowl. mix them with a fork. Add little water,Black Pepper Powder to it to make it smooth batter. The batter should be not too thin, not too thick. Keep aside the batter. When this mixture becomes cool, grease your palms and make oval shaped croquettes out of them. Size may be your choice. Now take a plate and put the maida on it. In another plate put the breadcrumbs. First roll each chops in maida & dust the excess maida, dip the croquette/chop in above Besan mix and roll in breadcrumbs. In this way make rest of the Chops. Refrigerate the croquettes/chops for an hour before frying to make the binding better. You could refrigerate these for about 4-5 days in a closed container. Take them out of the oil and place onto paper towel to absorbe the excess oil. Serve hot "Bhegitabil Chop" with cucumber salad and tomato ketchup. Enjoy the typical "Bengali Bhegitabil Chop" in chilled Winter with a hot cup of ginger tea.